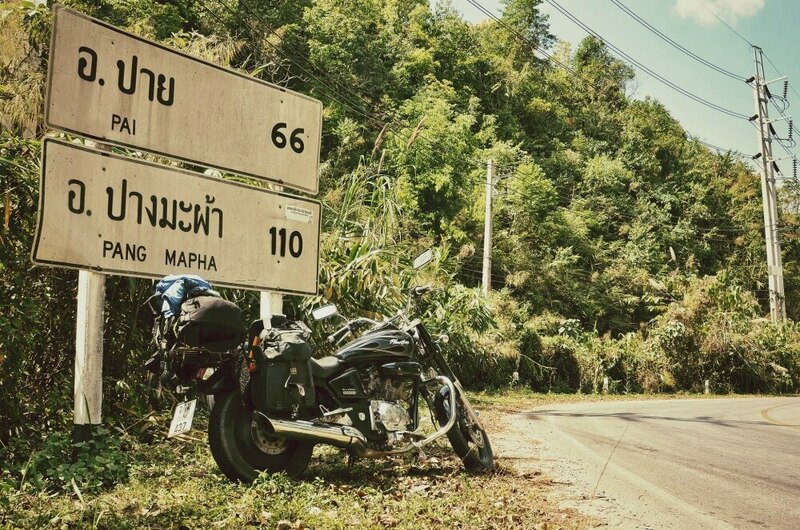 The Famous Mae Hong Son Loop is a fantastic motorbike adventure. Found in Northwest Thailand, its one of the most spectacular sealed road loops in the world. You’ll drive past beautiful rice fields, through forests, over hills and mountains, passing water buffalo on the way. Local people wave as you pass their villages, and you’ll see things that few travelers in Thailand do. The Mae Hong Sone loop takes a minimum of four days, but we suggest you take some time out in the towns along the route. Here is a proposed itinerary for this amazing bike route. When you leave Chiang Mai, the start of the route is fairly simple. Exit out of the South Gate of the Old City then follow Thipanet Road until you get to the airport. Mae Hong Son is well signposted. Follow Route 108 towards the town of Hot, this should take around an hour. It is a straight road and simple to follow. Once you have turned right at the roundabout you will continue on Route 108 and the town of Mae Sairang is well signposted. At this point, the scenery becomes very beautiful. Mae Sairang is an authentically beautiful town which benefits from the cultures of both Myanmar and Thailand as it borders both countries. Less popular than Pai with tourists and travellers, this makes it a more peaceful and less commercial experience. If you are looking for a quiet yet culturally rich place to visit then look no further than Mae Sairang. There are amazing treks to the Karen & Lawa Hilltribe Villages if you are seeking a little adventure. Otherwise, just renting a bicycle and exploring the town is a great way to absorb the ambiance. There is also plenty of opportunities to buy wonderful handmade jewellery and other local crafts. Why not visit a temple while you are there such as Wat Phrathat Chom Thong. It is one of the oldest temples in Thailand with the ancient golden Buddha clearly visible from afar. Once you are at the top of the hill, you get a stunning view of Mae Sariang Town and the Yuam Valley. When leaving Mai Sairang the road is quite curvy and you will pass through a dense forest which eventually clears to a clear road with views of spectacular farmland. The traffic becomes much quieter at this point and you will pass through lots of small villages that are welcoming for a rest and refreshment along the way. As you get closer to Mae Hong Son, the roads become very curvy again and the views are fantastic. Mae Hong Son City is nicknamed “the city of three mists”. Being the most mountainous province in Thailand makes this place pretty spectacular. It is much bigger than Mae Sairang and a little busier. There is plenty to do here. If you are interested in art and history then visit Wat Jong Klang where you can view glass Jakarta paintings that are over a hundred years old and a museum with ancient wooden dolls from Myanmar. The temple is lit up at night and is reflected in Lake Nong Jong Kham which is quite stunning. There is also trekking to be done here and a visit to the Long Neck Karan Tribes is popular with tourists (but ethically, not for everyone.) Sutongpe Bridge is another lovely spot to visit. The original bridge made completely of bamboo crosses over beautiful rice paddies and fields. It makes for great photo opportunities and a delightful place to see the sunset. The road to Pai is a short but winding one. It goes round in one big curve with lots of twists and turns along the way. Route 1095 has 762 bends in total. 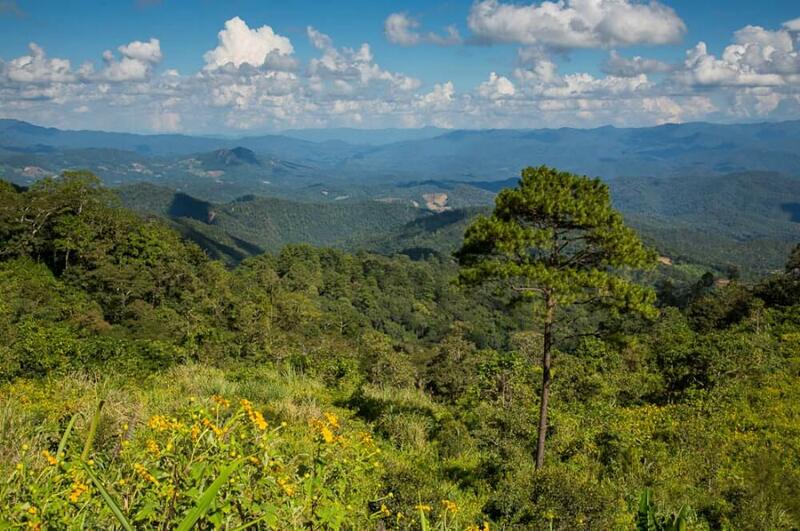 This is one of the most beautiful parts of the Mae Hong Son Loop. The motorbike certainly beats being cramped up in a sweaty minibus with other tourists. It’s best to take it slow, some of the corners are very tight and besides, you will want to take in all that gorgeous scenery. There are plenty of nice eatery’s and bungalows along the way if you want to spin out the ride. If you are feeling really adventurous you could visit the Tham Pha Mon cave which is located near Soppong en route to Pai. Pai is a very popular spot on the travellers routes and not without good reason. It is a beautiful little town nestled up in the mountains with a relaxed atmosphere and friendly people. Pai is probably one of the most chilled out places in Thailand or indeed the world. There are many cozy and quaint little cafes and bars just waiting to be discovered by you with the most delicious food. One fantastic place definitely worth checking out is The Container which has hanging egg chairs that look out onto the most beautiful view of the hills. Pai is also very popular with musicians with a lot of good reggae coming from this part of the country. If you are lucky you may be able to check out a local band such as Rasta Flower. Artists and musicians flock to this town and make it a wonderfully vibrant place to be. Pai Circus School is a hostel that has become popular among travellers looking for a fun and unique experience. One thing’s for sure; you will not find it hard to party in Pai. 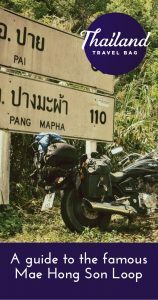 If you can bear to prise yourself away from Pai, be sure to wear full protective clothing (including your feet) and a decent crash helmet as the first 40km of this journey is probably the most treacherous on the Mae Hong Son Loop. After that, it tends to get a bit easier but there are a whopping 762 bends to contend with along the way. It’s all good fun though. There’s lots to see and do on the way including the Tha Pai Memorial Bridge. You will find it 9km along from Pai on the way to Chiang Mai. It was built in World War Two by Japanese soldiers and is a very popular place to take some amazing photographs. You will find many friendly villages on the way to Chiang Mai who will welcome you with that famous Thai smile and a decent coffee to boot. Once you hit the highway you will be able to relax in the knowledge that Chiang Mai is only a short easy ride away. There is so much to see and do in Chiang Mai you should try and spend at least a week there. It’s such a culturally rich and fascinating city that is steeped in history. It was once the capital of Thailand, in fact until 1558. Just renting a bicycle and exploring the city by yourself can be a wonderful way to get to know Chiang Mai. You may want to stay within the city walls where the hustle bustle of the city gives a vibrant and fun energy. The markets are fabulous and if you can fit in a cooking class, this is a great place to do it as you will be shown around the food markets first. There are hundreds of fantastic temples to visit in Chiang Mai. Check out our guide here. Make sure the bike is powerful enough to see you through the long and sometimes tough journey. Make sure that your insurance covers motorbikes. Find some travel buddies to join you on this epic journey. It is always good to have support on the road. Always wear sunscreen even when it is overcast. Charge your phone between stops. So there it is. Our guide to one of the Mae Hong Son Loop, one the most amazing trips of your life. Have fun and take lots of photographs.